Dr. Lasley is not accepting any new students in his lab at this time. 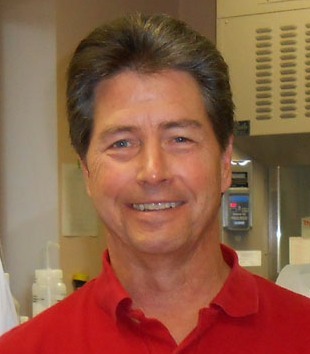 Dr. Robert Lasley's research is focused on the effects of stress on cardiac structure and function. Specifically his studies address the role of a specific G protein coupled receptor, the adenosine receptor, which is activated during hypoxia, ischemia, and inflammation, by increased production of the ATP catabolite, adenosine. Adenosine exerts its effects by the activation of four subtypes of adenosine receptors – A1, A2A, A2B, and A3 - which are expressed on various cell types in the heart. Our previous studies focused on the effects of the A1 receptor on cardiac myocyte responses to β-adrenergic receptor stimulation and ischemia. Current studies are focused on the roles of A2A andA2B receptors, which are highly expressed on cardiac fibroblasts and macrophages. These two cell types play key roles in the initial inflammatory and subsequent healing processes after a myocardial infarction (MI). Prolonged inflammation and excess collagen deposition in the heart after an MI leads to adverse ventricular remodeling which can lead to heart failure. In vivo and in vitro studies are examining potential beneficial effects of whole animal A2B receptor KO on these chronic aspects of MI. Plans are underway to use myeloid and fibroblast-specific A2B receptor KO mice to address the specific roles of the A2B receptor in these cells.